The first thing you need for the rocket is some form of bung in the bottom of the bottle through which you can pump some air. There are various ways of doing this, one of the best is to use a rubber bung or cork, similar to those which are used in science lessons and wine making. You will need one that will jam into the neck of the bottle well. If you can't get a rubber bung you can make one out of a wine bottle cork, ideally one that tapers so it is wider at one end than the other. However, wine bottle corks are often too small, and for an ideal bottle rocket you will need something with more grip. A good way to get this grip is to cover the cork with a couple of fingers cut from an old rubber glove - turn these inside out so that they make a good seal on the inside of the bottle. Glue it all together to seal the gaps. A rubber bung with a ball inflater A rubber bung with a bike valve A cork covered in rubber glove fingers with a ball inflater A cork with a bike valve through the middle. You then need to be able to connect the bung to the pump. If you have a football inflating adapter you can push it into the bung, but you may have to drill from the other side to make a hole for it to meet. You can also use a bike tyre valve to make a more robust version. Keep safe - get an adult to do the drilling and if you are the adult be very careful drilling rubber - it is not predictable, and will catch in unexpected ways. You could try holding the cork in the top of a bottle. Once you have made your bung, you then need a launcher. This can be as simple a 4 or 5 pieces of wood or dowel knocked into the ground around the rocket to hold it stable while it launches. Put some (or no) water in your bottle, jam the cork in and pump it up! Be careful not to stand over the rocket as it is a rocket, so is about to fly upwards very quickly!! Try using different amounts of water to see how that affects the flight. You could try adding fins to make it fly straighter. You should find that the bung is pushed out and then the rocket flies up into the air in a very satisfying way. Many thanks to the Fracture Group in the Cavendish Laboratory for the use of a high speed camera. Sir Issac Newton worked out something very fundamental about the universe, he said that 'every action has an equal and opposite reaction' - what this means is that for every force there is always an equal and opposite force. So if you push something one way it will push you back. If you push something it will push back - every action has an equal and opposite reaction. So if you throw a weight in one direction it will push you over in the other. This is how your bottle rocket works. The rocket is pushing water downwards, which means that the water pushes the rocket upwards so hard that it overcomes gravity and will fly! As you pump air into the bottle the pressure inside builds up, this air pushes out in all directions, including downwards on the bung. At a certain pressure the friction between the bung and the bottle is not strong enough to hold it in and the bung gets pushed out. This allows the water to be pushed out by the air that you have pumped in. It also means that the main factor controlling what pressure the rocket launches at, and therefore how high it goes, is the amount of friction on the bung. This is why you should cover a slippery cork with a high-grip rubber glove. As the water is pushed out the air expands air the air pressure reduces slightly. Eventually, normally after 2-3m the rocket runs out of water and it coasts for the rest of its journey. Pumping air into the bottle increases its pressure Eventually the bung is pushed out allowing the water to escape The air pushes the water down which means the water pushes it back. This force is then transferred to the rocket. Eventually the rocket runs out of water and just coasts. Why does it still work with no water? 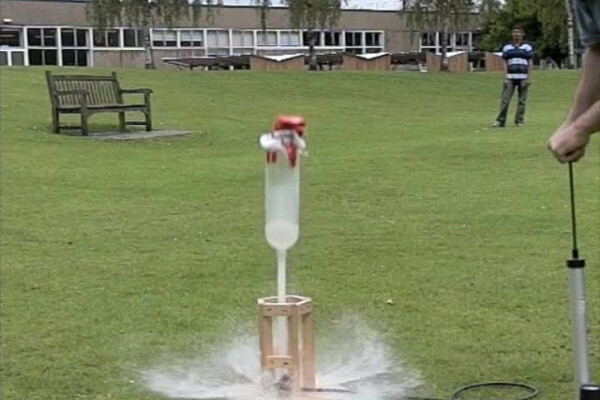 Even with no weight of water inside the bottle, the bottle rocket will still fly upwards. Thsi is because the air in the bottle has a mass so when it is pushed downwards there is still an equal and opposite reaction pushing back up. However , because air is very light the bottle will empty very quickly. This means the force doesn't last very long, but as the rocket is very light it will accelerate very quickly. The air being pushed downwards also produces an upward force on the rocket. But the air escapes very quickly so the force doesn't last long. Eventually the rocket starts to tumble, slowing it down. Fins tend to stop this making it travel further. Why doesn't the almost full rocket work well? In this case the rocket will have a large upward force on it from pushing the water downwards, but the bottle will be very heavy. This excess weight will mean that it doesn't accelerate very fast. Also, because there is little air in the rocket, the air would need to expand to 3-4 times its original volume in order to push out all of the water. This means that the pressure will drop drastically and the air will no longer be able to push the water out. The rocket will often crash back to the ground still half full of water. There is a large force to start with but the rocket is heavy so it doesn't accelerate quickly. As the air expands its pressure decreases rapidly. Eventually the pressure reaches the same as outside so the water is no longer pushed out and the rocket will slow down and fall. How much water should I put in? This depends on lots of things, such as what pressure the bung will come out, the air resistance of your rocket and how much payload it is carrying, but between a quarter and a third full works well.